Solid-state drives with a PCIe interface have become standard storage solutions for enthusiast-grade PCs these days. By contrast, gamers with budget constraints tend to buy SSDs featuring a SATA bus because of their lower price. To address such customers with something faster, SSD makers release new product families based on inexpensive controllers and NAND memory. Over the past few months, we have seen announcements of such drives from various makers, now it is Kingston’s turn to try its luck with inexpensive NVMe SSDs. Kingston’s A1000 NVMe SSDs are based on the Phison PS5008-E8 controller (four NAND channels, LDPC, NVMe 1.2, PCIe 3.0 x2 interface, etc.) and 256 Gb BiCS 3D TLC NAND flash from Toshiba. The Kingston A1000 SSDs will come in 240 GB, 480 GB, and 960 GB configurations, thus targeting people looking forward more or less decent capacities. It is a little bit surprising not to see a 120 GB model in an entry-level SSD family, but skipping this capacity point has its rationale: Kingston avoids a race to the bottom by not competing against the cheapest SSDs with a SATA interface (something that preserves its profit margins and reserves NAND for more popular products). Peak sequential performance of the Kingston A1000 drives is rated at up to 1500 MB/s for reads as well as at up to 1000 MB/s for writes, which is considerably higher when compared to SATA SSDs, but is substantially lower when compared to drives with a PCIe 3.0 x4 interface. As for random performance, Kingston specs the drives for up to 120K/100K read/write IOPS, which is a bit lower when compared to some competing offerings featuring the same controller and memory. As for reliability and endurance, all the Kingston A1000 SSDs are rated for one million hours MTBF and come with a five-year warranty. The entry-level 240 GB model is rated for 150 TB TBW (to be written), whereas the 960 GB SKU is expected to handle 600 TB TBW, which equates to around 0.34 TB DWPD (drive writes per day) over five years, a rather high rating for an entry-level consumer SSD series (but naturally a bit below when compared to higher-end drives). Kingston advertises its A1000-series SSDs as offering “twice the performance of SATA at near SATA pricing,” so their MSRPs are just as important as their performance characteristics. 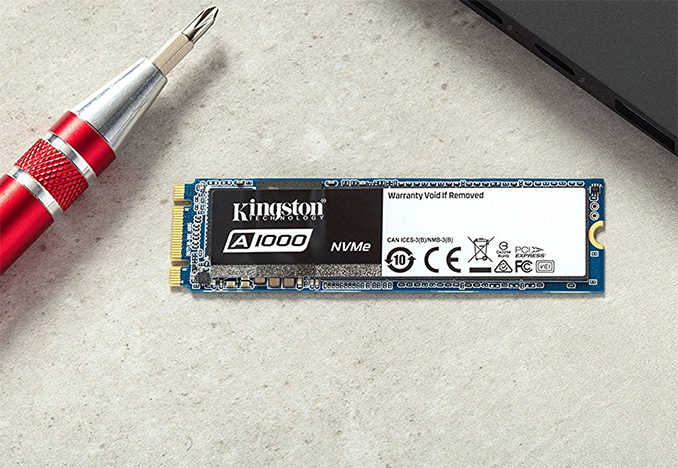 At present, the Kingston A1000 SSDs are only available directly from the company with a ~30% discount, but the manufacturer says that the drives will be available from leading retailers like Amazon and Newegg shortly. Right now, the A1000 240 GB is listed for $120, the 480 GB model costs $218, and the 960 GB SKU is priced at $403. A quick calculation shows that Kingston is selling its new drives at $0.41 - $0.5 per GB, which is not that high, but which is in line with prices of the speedier MLC-based Kingston KC1000-series. Meanwhile, there are faster 3D TLC-powered drives available at around $0.35 per GB, or even lower. Since the A1000 is only beginning its life cycle, its price may be higher than it should be. The market tends to “fix” pricing of products over time. "gamers with budget constraints tend to buy SSDs featuring a SATA bus because of their lower price. To address such customers with something faster, SSD makers release new product families based on inexpensive controllers and NAND memory." But as for consistency and continuous read/write speed, how are these kingston drives better than an 850 Pro Sata drive? Do they exhibit less throttling than an 850 Pro when hot? "Since the A1000 is only beginning its life cycle, its price may be higher than it should be. The market tends to “fix” pricing of products over time." It's brand new and overpriced and the price will drop in short order. Peak performance is not really relevant to me when both drives cost the same! I would expect lower pricing for a so called entry level SSD of any sort, does not seem by pricing alone to be all that much lower cost than others with similar if not superior specs. 1200/800...100k/80k for $165 USD it would be quite "fair" but anything above the $200 price point is not exactly entry level in my books because usually "entry level" means "budget priced" which this certainly is not, 240gb for ~$100 instead of $120, 480 for ~$170-$190 or something along these lines.